Protein Pump Inhibitors. Are they doing you more harm than good? Proton pump inhibitors (PPI’s) such as Omeprazole or Losec rank among the top 10 prescribed classes of drugs in the world and one of the most widely used medicines in New Zealand and are commonly used to treat acid reflux, heartburn, indigestion, and peptic ulcers. Although generally assumed to be safe, recent studies have shown that they have numerous side effects, from an altered gut environment and impaired nutrient absorption to an increased risk for cardiovascular events, kidney disease, and dementia. The purpose of this article is to provide an overview of the benefits and risks of PPI use, focusing on scientific studies published in the last few years as well as natural solutions for treating both cause and symptoms of reflux and heartburn. The Best Practice Advocacy Centre New Zealand (bpacnz) state that in NZ in 2013, there were 428 dispensed prescriptions for omeprazole (commonly known as Losec), for every 1000 registered patients, making it the third most widely prescribed medicine in New Zealand. 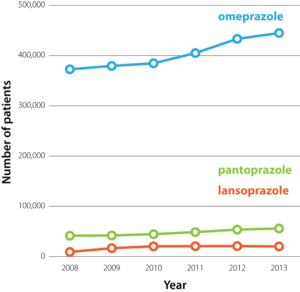 The number of patients prescribed PPIs in New Zealand has increased steadily over the past five years (Figure 1). In 2013, the New Zealand health sector spent a whopping $4.28 million on Omeprazole capsules alone; over one-quarter of this was for omeprazole 40 mg capsules, the highest dose formulation available. Most commonly PPIs are used to treat GORD and to prevent gastric and duodenal ulcers. Of the general population, 25% report having heartburn at least once a month, explaining the enormous demand for PPIs. Nevertheless, PPIs are frequently prescribed or taken for long periods without evidence-based indication. Before we discuss the benefits and potentially harmful effects associated with PPIs, it’s important to understand what they do in the body. PPIs inhibit proton pumps, specifically the proton/potassium pump of parietal cells in the stomach. The theory is that heartburn is caused by excess production of stomach acid by these cells. So by inhibiting this proton pump stomach acidity will be reduced and prevent the burning sensation of acid reflux or the formation of peptic ulcers. However, proton pumps are in just about every cell in the body – not just the stomach. All cells, except red blood cells, have mitochondria that allow your body to break down carbohydrates and fat to produce energy. 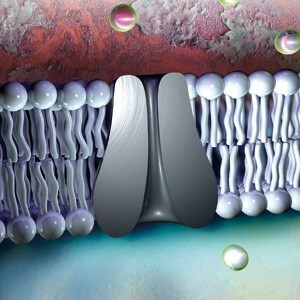 They do this by pumping protons across the membrane to generate a source of electric potential that can be harnessed to form ATP, the body’s main storage form of energy. So, if the proton-pump system is not working well, the body has to rely on anaerobic systems to produce energy, and this leads to rapid fatigue. Proton pumps are also crucial in the transport of various substances in the body. And while PPIs are designed to specifically interact with the hydrogen/potassium pump in parietal cells of the stomach, research suggests that they likely have nonspecific binding capabilities. This means these pharmaceuticals can bind to other proton pumps as well. Though PPIs don’t stay in the blood for very long, their binding to proton pumps is essentially irreversible—they will continue to inhibit the proton pump until the antioxidant glutathione can bring about dissociation. What does cause Gastro oesophageal reflux disease (GORD) and heartburn then? If you ask most people what causes heartburn, they will say “too much stomach acid.” However, other medical models do not consider GORD to be due to excess stomach acid, but due to a dysfunction of the muscular valve (sphincter) that separates the lower end of the oesophagus and the stomach, the lower esophageal valve (LES). 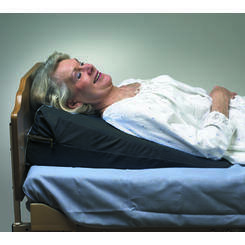 In GORD, the LES malfunctions because of an increase in intra-abdominal pressure. This pressure causes distention (i.e. bloating) in the stomach, which pushes the stomach contents—including acid through the LES into the oesophagus. But what causes the increase in abdominal pressure in the first place? It seems that one of the leading causes may be too little stomach acid, which in turn contributes to an overgrowth of bacteria in the small intestine (SIBO). Studies on genetically altered mice that are incapable of producing stomach acid support this theory. They develop bacterial overgrowth in their intestines—as well as inflammation, damage, and precancerous polyps. The understanding that not enough—rather than too much—stomach acid may be to blame for heartburn and GERD has important implications when it comes to determining what the safest, most-effective and longest lasting treatment would be. With this in mind, let’s see how PPIs may cause issues. No doubt that the PPIs may assist with short-term relief. 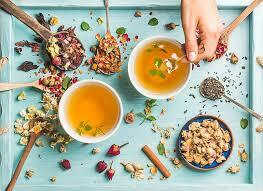 However, there are more natural, less harmful ways to do this, particularly for reflux and heartburn. 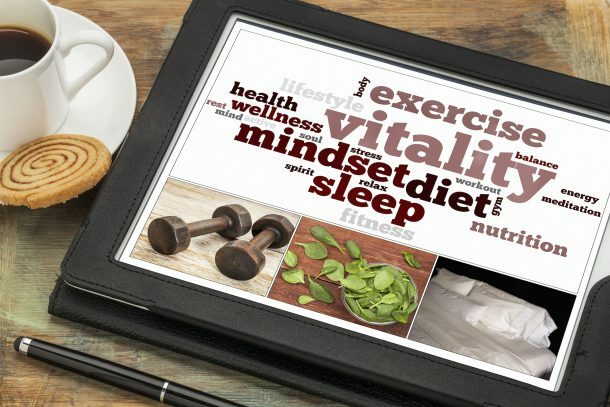 The solution is often as simple as addressing the patients underlying diet and lifestyle. Increased risk of cancer and other diseases such as irritable bowel syndrome (IBS), Crohn’s disease, depression, anxiety, autoimmune disease, and asthma. It’s worth noting that proton-pump inhibitors (PPIs), are only meant to be used short term and never supposed to be prescribed for years or even a lifetime, as is often done today. Gastrin is the hormone that stimulates parietal cells to release gastric acid. When PPI’s inhibit gastric acid production, gastrin release is increased to compensate for the decreased acidity of the stomach. Recently, several studies have suggested that when PPIs are withdrawn the body will continue to produce gastrin at above pre-treatment levels, causing an effect referred to as rebound acid secretion. Hence patients may get an overproduction of stomach acid after taking PPIs, and that is why getting off PPI therapy may be difficult. The good news is that your stomach cells should have mostly turned over in a few months. But we are still unsure if the body can fully repair these cells after coming off PPIs. By treating the symptoms of a condition we not only fail to address the underlying root cause but may cause longterm effects! PPI use reduces the amount of acid produced in the stomach, and ultimately the amount of stomach acid that reaches the gut, causing a significant shift in the pH of the intestines. This, in turn, changes the gut microbiota. Several recent studies have shown that PPI alters the gut microbiota by reducing its overall diversity. Opportunistic pathogens, including Enterococcus, Streptococcus, Staphylococcus, and E. coli, tended to be more prevalent in the guts of PPI users. Studies also found a significant increase in the number of people with small intestinal bacterial overgrowth (SIBO) among PPI users. Stomach acid is essential for the absorption of many nutrients. A 2013 study indicated that PPI users have an increased risk of vitamin and mineral deficiencies including vitamin B12, vitamin C, calcium, iron, and magnesium. A lack of stomach acid and stomach inflammation may lead to an overgrowth of bacteria, which consume micronutrients like vitamin B12. Additionally, studies have found an association between PPI use and total bone fractures in the elderly. But it may not only be nutrient deficiency causing the PPI effects on bone health; osteoclasts, responsible for the resorption of calcium, also possess proton pumps, and their activity is thought to be directly affected by PPIs. Several recent studies have also shed light on PPIs and the cardiovascular system. PPI users have been shown to have a significantly higher risk of heart attack than those on other antacid medication. PPIs also reduce production of nitric oxide, a natural substance that promotes the dilation of blood vessels and improves blood flow. The kidneys are also affected by PPIs. A study published in 2016 compared patients using PPIs to patients using H2 blockers, another common antacid drug. They showed at over a five year period, those in the PPI group were 28 per cent more likely to develop chronic kidney disease and 96 per cent more likely to develop end-stage renal disease. PPIs also impair cognitive function. A 2016 study found that regular PPI users had a 44 percent increased risk of dementia compared with those not using the drugs. A different study published in 2015 that assessed cognitive function in PPI users versus controls found statistically significant impairment in visual memory, attention, executive function, and working and planning function among PPI users. What are the alternatives to PPIs? Collectively, these and many other studies suggest that PPIs are not as safe as they are made out to be. 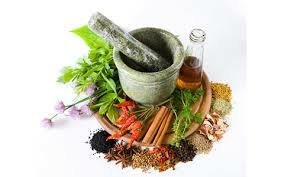 The great news is that there are plenty of Naturopathic Medicine solutions to consider. Some of these are outlined below. 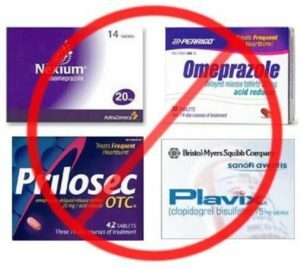 If you feel you would like to avoid PPIs, there are some alternatives. Always consult with your medical practitioner before discontinuing the use of PPIs and be sure to reduce your dose gradually to prevent any withdrawal symptoms. 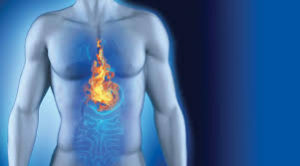 If reflux and heartburn are caused—or at least contributed to—by low stomach acid and bacterial overgrowth in the intestines, it follows that the best way to treat it is to improve stomach acid production and reduce bacterial overgrowth. This strategy addresses the underlying causes of the problem, whereas the conventional approach (acid-stopping drugs) merely suppresses the symptoms. Replacestomach acid, enzymes and nutrients that aid digestion and are necessary for health. Eat a low-carb diet. Malabsorption of some carbohydrates may lead to bacterial overgrowth, resulting in the bloating and increased abdominal pressure that drives acid reflux. Your Registered Nutritionist or Naturopath may prescribe a FODMAP, GAP or SIBO diet and nutraceutical protocol to treat this. In one study at patients who had failed conventional GORD treatment (i.e. acid-stopping drugs) experienced a complete resolution of their symptoms within one week of adopting a low-carbohydrate diet. In another study, also at Duke, a low-carbohydrate diet was just as effective as PPIs in a group of obese patients with GERD. Work with your Naturopath to find out the underlying cause(s). He or she may explore the role of Small Intestinal bacterial overgrowth (SIBO) ( or other overgrowths such as fungal or parasites may be playing. H. pylori bacterial may also be present. Blood tests and or stool sample of the SIBO breath test will tell us more. Eat small meals and have gaps in between breakfast, lunch and dinner to allow the gut to digest food well. Finish eating at least 2-3 hours before bedtime. An overly full stomach places excessive pressure on the diaphragm, causing acid to travel upward. Stay upright after all meals. Drink water away from meals, so the stomach acid needed for digestion is not diluted and hence slowing down food breakdown. Stop smoking as this increases acid production. Avoid alcohol, caffeine, high fat foods such as cheese, spicy, citrus, carbonated drinks and processed foods which may all cause symptoms. Manage stress as this can slow down digestive function. Cheung KS, Chan EW, Wong AYS, et al. Long-term proton pump inhibitors and risk of gastric cancer development after treatment for Helicobacter pylori: a population-based study Gut 2018;67:28-35. (2013). Proton pump inhibitors and risk of vitamin and mineral deficiency: evidence and clinical implications. Therapeutic advances in drug safety, 4(3), 125-33. Nassar, Y., & Richter, S. (2018). Proton-pump Inhibitor Use and Fracture Risk: An Updated Systematic Review and Meta-analysis. Journal of bone metabolism, 25(3), 141-151.